In this video, Greg ties a prospecting fly he calls the Counterfeit. He has fished it on countless trout streams in the Western USA with great success when all else fails. He recommends tying it in sizes 14-16 with a 60° bend jig hook and a slotted tungsten bead in variations of peacock, peacock/black, and dark green. You could use peacock for the abdomen for a uniformed taper look, but Greg prefers Hareline’s Ice Dub for the buggy nature and movement of the material. Combined with CDC, the movement of this fly will make trout and steelhead go crazy. 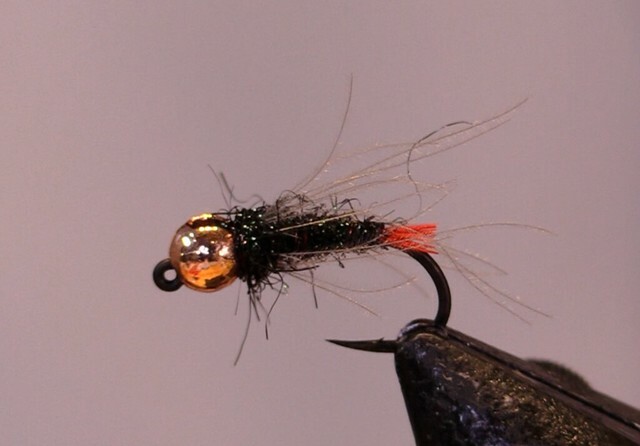 Use of a Gamakatsu J20 jigged hook or something similar with a 60° hook-eye bend with a slotted-tungsten bead is key to these flies “nymphing” effectively. The hook faces upwards during your drift lessening your chances of snagging on the bottom and you want to fish these types of flies deep and often times near the bottom. Tungsten beads give you the weight necessary to get the fly in the zone as quickly as possible and the weight to feel it on your rod for ultimate sensitivity. Greg uses this fly on his European-nymphing setup as a terminal fly, but you could also use it under an indicator or under a dry fly for a dry-dropper setup.